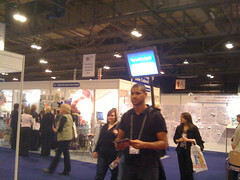 I’ve just spent the last 2 days roaming around the Scottish Learning Festival for another year. As usual I’ve enjoyed the experience and learned a lot. I’ve not attempted to blog or record any of the sessions I attended this year, as my finger and brain speed are not up to it. I do have a collection of reports to recommend which are full of reflection, linkages and information: glowict’s blogpost and slf2008 Bookmarks on Delicious (glowict in a delicious account I’ve set up to use in the ICT national glow group). This year I was fortunate enough to spend a lot of time with Tom Barrett Tom seems to know about and have tried just about every good teaching idea I have heard of and more. His positive view on things is inspiring. Even more than usual the best bit of SLF was the chance to meet with all of the colleagues whose blogs I have been reading and ideas that I’ve been following over the past year. I had decided not to carry anything but my new iPhone to see how I got on without lugging a laptop around. I practice this meant that I could check links, take some photos and use twitter. My typing on the phone is not up to more that twitter’s 140 characters for notes. It was nice not to carry anything, but I’d have liked to be able to type a bit faster or have used the VoiceNotes app a bit more, I did record David Noble asking Fiona Hyslop a question at her keynote and to my surprise it came out well (huge auditorium ), quite clear after a quick run through the Levalator and application I continue to be impressed with. 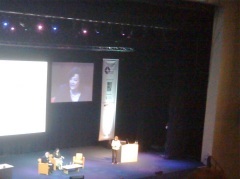 Not quite as good quality as the official Fiona Hyslop Keynote SLF 08 from LTS. Fiona Hyslop’s keynote was fairly interesting, she seems to be very much in favour of lots of good stuff™ and after the rather disappointing glow chat it was very refreshing to hear her take questions from the floor. I had always, cynically perhaps, thought that questions to politicians would be prepared in advance. Much to the delight of the ScotEduBloggers in the audience the first question was from Neil Winton questioning the internet filtering for staff and pupils common in Scottish schools (38 minutes in on the LTS video), the minister’s answer was that while she would be happy to have teachers in control of her child’s access, it was a local Authority issue. This made me reacall John Connell’s call, last year, for a national conference on the issue. A quick search for filter on John’s blog is an excellent read. Many of the other questions had similar answers the minister explaining her sympathy with the questioner but laying responsibility at the LA door. The minister did promise to discuss this and to help liberate the learning experience (40 minutes in on the vid). ScotEdubloggers were well represented in the questioning as well as Neil, we heard David Gilmore, Adam Sutcliff and David Noble all asked questions. The Minister has little time of league tables and stated that employers want folk with the 4 capacities rather than exam results (slight paraphrasing there). On watching bits of the video I am more impressed than I was the first time through, close ups may communicate more than a long distance view. For the rest of the day I avoided keynotes and presentations, wandered the stalls and networked. At 2 I headed for the Education showcase and laughed with the children from Down the Pan ? a financial drama from West Dunbarton before taking part in The Discovery Hour: Inspiring Stories of Technology, Education and Design which was a series of 10 minute or so talks on interesting tech and teaching, my own tail was of two international collaborations that my class have been involved in most recently the weetom travelling healthy art show exhibition suitcase to Russia a combination of cardboard glitter and mp3 technology and our wrapping the world in poetry with students from Georgia USA (see posts in this archive and the McClure – Sandaig – blogs if you are interested). My point is that personal contact with participants is vital and keep task short and fun. Wednesday evening I went to teachmeetSLF08. 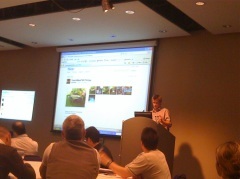 Having tweeted an invite to Tom I was delighted that he was first up talking about work his school had carried out with the Philips Entertaible a fantastic looking multi touch table (see Tom’s TeachMeet’08 Philips – a set on Flickr). The rest of teachmeet was perhaps slightly subdued compared to usual, maybe because of the uncertainty of the future of the even with Ewan‘s departure from the Education field for channel 4. This seems to have been resolved by Joe Wilson’s tweet. Ewan’s organisation and leadership on the evening were taken over ably by David Noble for both some of the preparation and the second half of the night. As usual the ideas from the presentations came quick and fast, a new feature was to split into groups for some. I followed Theo to the escalator outside to see his Canaletto at the SECC presentation, where he showed a dislike of categorising media into any particular corner and some lovely examples or rich media. Ian Stuart presented live from Islay which I think is a first for teachmeet and flashmeeting did not let us down, strange watching a presentation without a presenter! Teachmeet was followed by TeachEat at Konaki Greek Taverna where we were fed by RM. I alway enjoy the idea of sitting down in random order and talking to random folk, this time Theo, Mike from Radiowaves (who I forgot to thank for the teachmeet sponsorship), he told me of the very exciting NUMU project (NUMU is a safe community for young people to showcase their music; collaborate, compete and develop their talent) and the guy from WildKnowledge whose name I can’t recall but who I had a great talk to about his products and could see that these could be extremely useful for recording trips. I popped into their stall on the floor next day and had another rundown of their products. 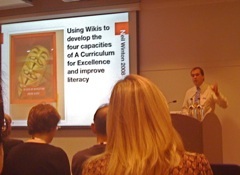 I started in Neil Winton‘s Wiki presentation, where he covered the use of wikis in the class, beautiful slides (Neils slideshare version SLF2008 Wikis (Simplified) is not quite as wonderful as the animations in the real thing), great examples and a warm delivery of a powerful message. I stayed in the same room to hear Ewan talking about professional development. Ewan was as usual inspiring and reaffirming helping teachers move outside their comfort zone and share. twitter as a tool for all sorts of things including writing an article for the Economist from tweets was a left field example! Ewan will have notes for us on his blog very soon. In the afternoon I was speaking about getting Web 2 into glow in the Glowing Lounge for a quick 10 minutes, I hope to write this up as a post sometime, but for the moment the easiest way I’ve found to pull rss and widgets into a glow page is to upload a file filled with html fragments and use that in an xml webpart. Most of the rest of the day was spent chatting and exploring ideas and technologies. Lastly a couple of interesting random things tracksticks and Easi-Scope, inexpensive toys I would like to use in the classroom. So I had a great couple of days at SLF this year thanks to my head teacher for releasing me, the main downside of SLF is the inability of many classroom teachers to attend maybe there will be a weekend version or Saturday morning added one year.